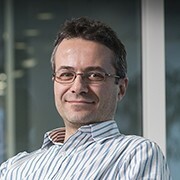 Antonio is a Principal Researcher at Microsoft, working on artificial intelligence, machine learning, computer vision and medical image analysis. I am particularly interested in deploying machine learning systems that work alongside doctors, and help them deliver more effective healthcare for their patients. Please check this 5-minute video, and the Project InnerEye site for more information on how we use machine learning in cancer treatment. The paper Deep Neural Decision Forests that I have co-authored with P. Kontschieder, M. Fiterau and S. Rota Bulo’ has been awarded the prestigious David Marr Prize at the ICCV 2015 conference in Chile. Please check the Decision Forests project if you are interested in the theory and application of forests in computer vision and medical image analysis. I have co-authored a large number of scientific papers and books, check my “publications” tab if interested. Here is an interview for the BBC on the InnerEye research project.